Background: In palliative care, administration of opioids is often indispensable for pain treatment. Pain assessment may help recognize pain and guide treatment in non-communicative patients. 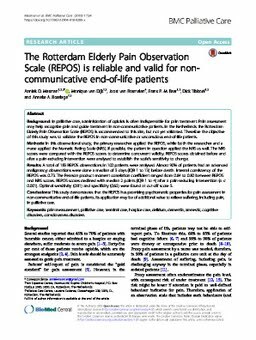 In the Netherlands the Rotterdam Elderly Pain Observation Scale (REPOS) is recommended to this aim, but not yet validated. Therefore the objective of this study was to validate the REPOS in non-communicative or unconscious end-of-life patients. Methods: In this observational study, the primary researcher applied the REPOS, while both the researcher and a nurse applied the Numeric Rating Scale (NRS). If possible, the patient in question applied the NRS as well. The NRS scores were compared with the REPOS scores to determine concurrent validity. REPOS scores obtained before and after a pain-reducing intervention were analysed to establish the scale's sensitivity to change. Results: A total of 183 REPOS observations in 100 patients were analysed. Almost 90% of patients had an advanced malignancy; observations were done a median of 3 days (IQR 1 to 13) before death. Internal consistency of the REPOS was 0.73. The Pearson product moment correlation coefficient ranged from 0.64 to 0.80 between REPOS and NRS scores. REPOS scores declined with median 2 points (IQR 1 to 4) after a pain-reducing intervention (p < 0.001). Optimal sensitivity (0.81) and specificity (0.62) were found at cut-off score 3. Conclusions: This study demonstrates that the REPOS has promising psychometric properties for pain assessment in non-communicative end-of-life patients. Its application may be of additional value to relieve suffering, including pain, in palliative care.